In our culture, where we’ve been trained to expect things to come to us with very little effort, and very little wait; where blogs make us all feel like writers, and Instagram makes us all feel like photographers and artists; it’s very refreshing and challenging to read about Beethoven’s hard work and singular commitment to art that his music required. 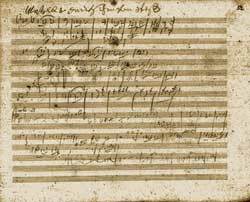 Beethoven had to labor over his compositions, and they needed many, many revisions to be what they are. This was encouraging for me, and hopefully it can be to other aspiring writers, songwriters, and artists. Good (or great) art doesn’t just happen; it doesn’t just spring spontaneously from our brains and our iPhones. Creativity takes work. I’m reading a biography on Beethoven at the moment (free on Kindle, by the way!). And it’s really good. The interesting thing about Beethoven is that, whether or not he was a Christian (and I don’t think he was), he had quite a few very Christian attributes in his character. The man was unique, and saw the world, and interacted with the world like a Christian should in many ways. Here’s what Fischer says about Beethoven, about the joy Beethoven had in the midst of sorrows, heartbreak, and failing health. You find loud echoes of this in Chesterton and Lewis too, if you’re familiar with their perspectives on God-given, Christian joy. Compare this with the Psalms, where David and the other psalmists write from both the mountain tops, and the deep, dark valleys of human experience. I really think this is a very Christian honesty with what it means to live in this fallen world. A Christian should be characterized by a “great joyousness” that’s deeply serious and grounded in an honest, humble view of living in a not-completely-redeemed reality. But our joy can have the “deepest seriousness” because we know redemption and restoration are coming with our King when He returns.